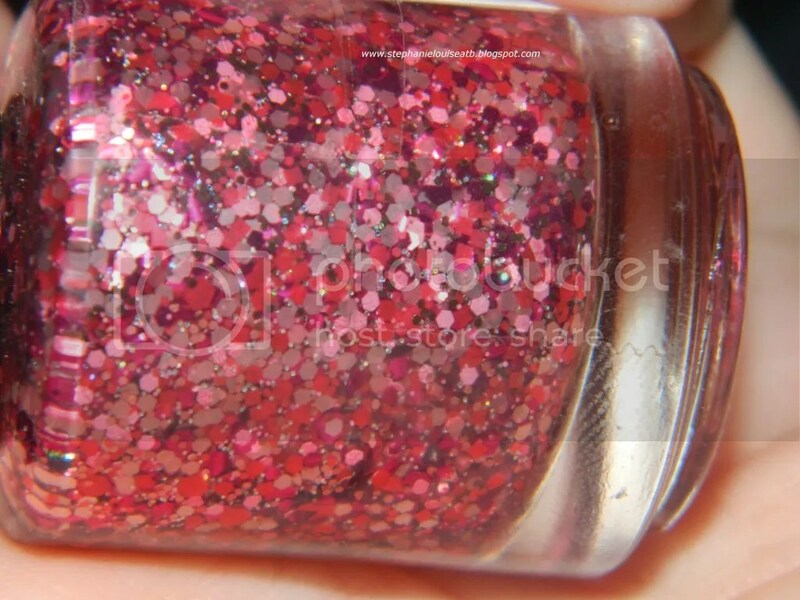 I love pink glitter so when Laura came up with another charity polish (her previous was Dani-Mite) I knew I was in. Know Hope from Nails by Laura on Etsy is a kaleidoscope of pink glitter & holo shimmers within a clear base. It is spectacular, even coming from someone who isn’t usually drawn to pinks. I paid my $10 & patiently awaited it in the mail, along with my custom polish “This is Halloween” which I have already swatched. & adore. Seriously. “Due to the success of Dani-Mite, our charity polish with 50% of the proceeds going to the National Brain Tumor Society (linked below, never to be made again! ), I’ve decided to do another Charity Polish for Breast Cancer Awareness! My mother is a survivor, and just about everyone I know or meet has lost someone or been affected by breast cancer- and I know it’s rare to hear from a person who can’t say the same! So this Cause will be near and dear to me and mine. “Know Hope” is a sparkly, pink polish made up of about 8 different glitters in various sizes and shades of PINK, of course! Like DaniMite, it will be a Limited Edition polish but with 300 made. I want (to) raise money and awareness, and I want to do it on a larger scale this time!! October is Breast Cancer Awareness month, so get your bottle today! Each bottle will be labeled as Limited Edition- 1/300, 2/300, etc. Know Hope from Nails by Laura: This is a fabulous mix of pinks ranging from raspberry to hot pink to the palest of pinks. With a touch of holo micro glitter, this really has a mind of its own. Some metallic, some satin, & some flat glitters mainly in the medium-small range. There are also a few large glitters thrown in all suspended in a clear base. Most are hexes but there are a few small squares. One of my favorite things about the Nails by Laura glitter polishes is that I can’t imagine running out. They are totally packed with glitter & because I tend to layer I often only need one coat. 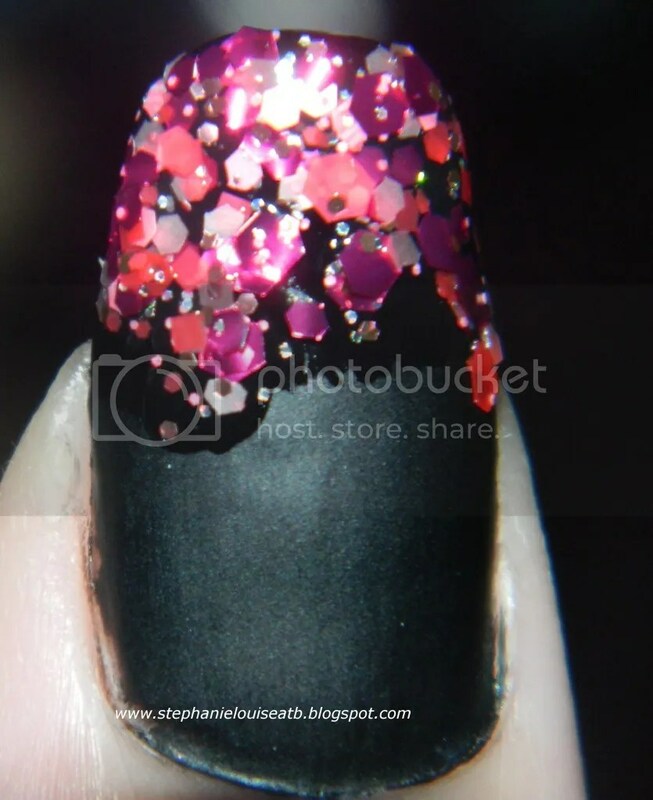 These glitters laid nice & flat & I think looked pretty cool on the tips of the black matte. Bit more fun I think! You can find this polish in the Nails by Laura Etsy shop, but it is indeed limited edition! You’ll not the 10/300 on my bottle AKA this is #10 of the 300 maximum she is producing. This is by far the most unique pink glitter I’ve ever owned, nothing else in my vast collection even comes close. She works with quite a few satin glitters in her creations which you rarely see in other venues. What do you think of my pink glitter tips? Are you feeling this polish? Have you picked up any awesome charity polishes this mont?